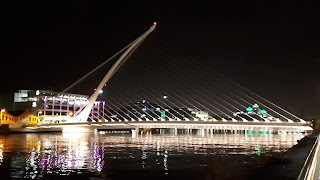 Welcome to my blog, I'll be posting articles about my travels, restaurant and hotel reviews and U2-related stories here, plus anything else that's going on in my life that I feel like blogging about! Hope you'll enjoy reading them and please feel free to add your comments. 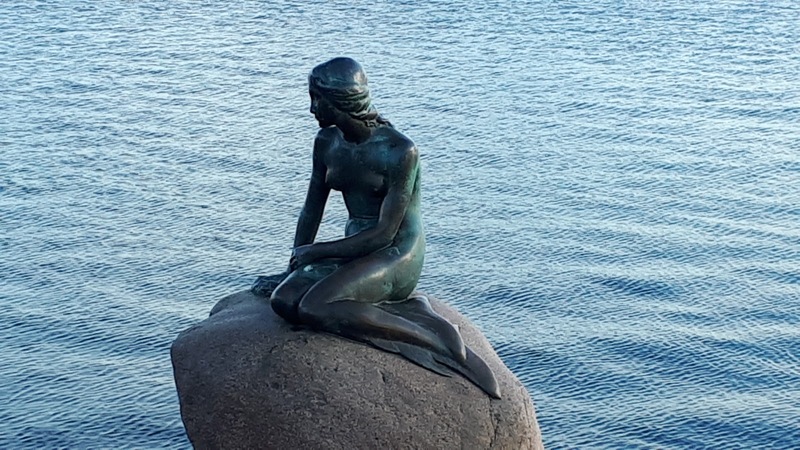 Copenhagen has always been on my bucket list and so I was really pleased to be able to visit at the end of last year, here's a write up of that trip. We arrived at the airport at 8pm and found our way to the station to get the train into the city. It was a short journey and we were amazed by the station itself which was wooden, very beautiful. Our Hotel the Copenhagen Star, was literally 200 yards from the station couldn't be handier! Our room was basic but clean and had all we needed. We went out and had a meal at a restaurant called Cafe du Nord which was opposite our hotel. The meal was good but pricey, but only to be expected in Scandinavia. 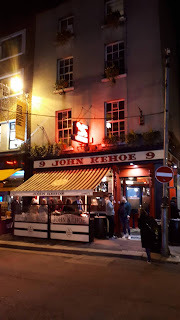 Whilst there we noticed that, although the area was not particularly seedy, it was a red light area as there were girls hanging around on street corners. 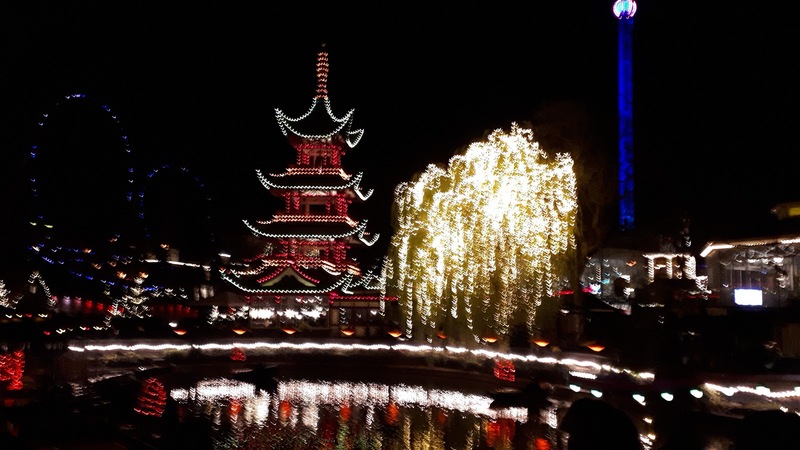 After breakfast at the hotel and went to the tourist information and bought a combi for the hop on hop off bus, boat tour and entry to the Tivoli Gardens. 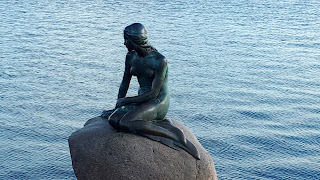 The bus tour was good, we saw the Little Mermaid (which was really little,) the colourful houses of Nyhavn, palaces, interesting modern buildings and much more. The boat trip went to some of the same places but you saw them from a different viewpoint. The weather was cold, but bright and sunny. After getting off the boat we visited a Christmas market which was lovely. Older areas of the city were interesting but I preferred Stockholm for that. Copenhagen is very flat and bikes are everywhere and you have to look out for them. from our hotel so they were very handy for us. They first opened in 1843 and have been going strong ever since. 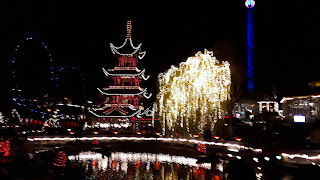 We were stunned when we went in as it was magical, due to the time of year the Christmas theme was evident (the gardens have different themes depending on the time of year.) Lights everywhere, huge Christmas trees, decorations, fairground rides, shops, cafes, restaurants, concert hall, theatre. Lots of fun and laughter, I've never been anywhere like it. Some of the rides were very old, for example the roller coaster is the original 1914 one, that added to the charm of the place. After a couple of hours we were beginning to feel a bit cold so we had a meal in a restaurant in the gardens called Paaflugen. It was cosy and warm inside and the food was good. 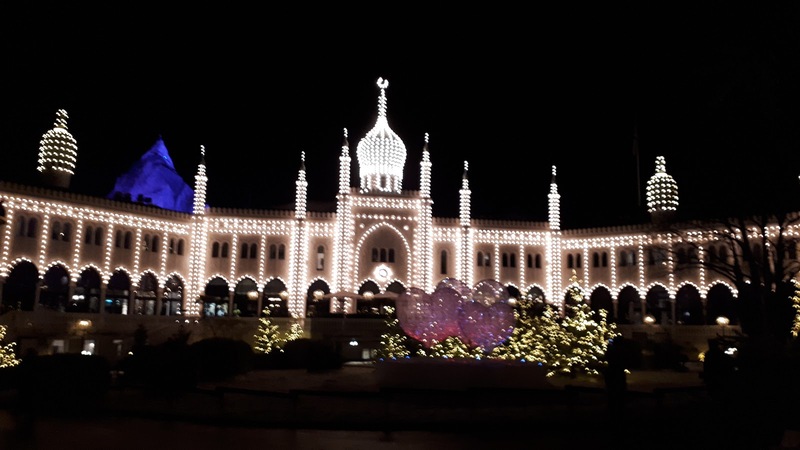 We both loved the Tivoli Gardens, it was such a unique experience especially special at Christmas time. The photos here don't do the place justice. We visited the National Museum of Denmark today. Outside it had an old facade but it was very modern inside. The ground floor was dedicated to Viking culture and had some fabulous exhibits. Lots of beautiful, intricately worked gold artifacts. There was also a floor dedicated to classical culture and I was especially interested in the Ancient Egyptian section. There were some amazing exhibits and the good thing was that you could actually touch some of them and throughout the museum you could also take photos which is really good. Later, in the evening Marian and I went on the Food Trail tour. Our guide was Bryony from Wales who was studying in Copenhagen. and loved the city. Our first stop was a hot dog van in the main square. 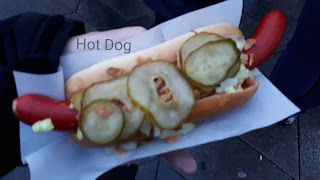 I don't like the hot dogs we have in the UK they taste like nothing, but I had heard how good Scandinavian hot dogs were. And boy it was good! The sausage was tasty and it had ketchup, remoulade, mustard, onions, sweet pickle on it with some crispy onions on top. Absolutely delicious and really warming on this cold night. Then we went to a pub called the Taphouse and sampled two small glasses of beer, in all they have 61 types to choose from! Very good they were too. We then walked to a food market and there tried Fiskedellen which was fish and potato mixed together, fried and served with bread and remoulade. Again it was really tasty. The final destination was was another pub called Skaal. 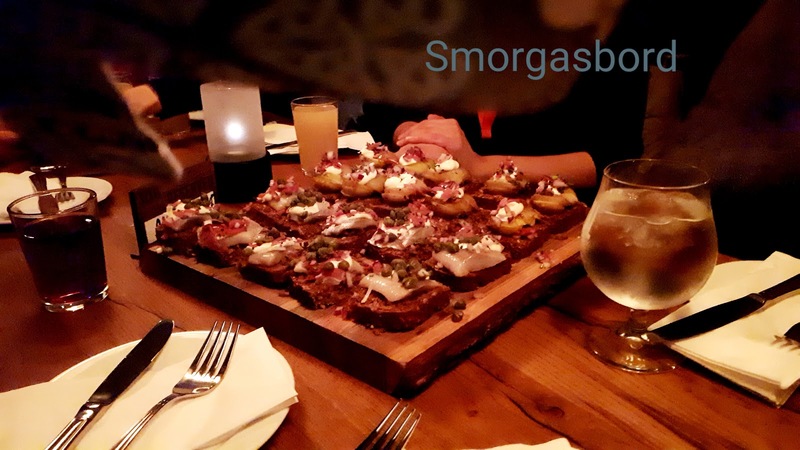 Here we sampled traditional smorgasbord, open sandwiches. There were two types, pickled fish and potato. I didn't like the fish, I've never been keen on raw fish. The potato one was nice and the rye bread they were on was really good. To finish off we had a Danish pastry and that was the end of the tour. 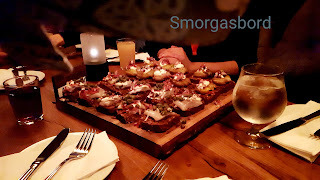 It was great to sample real Danish food like this and we were certainly full at the end of the tour! We had no idea where we were but with the aid of my mobile we found our way back to the hotel. 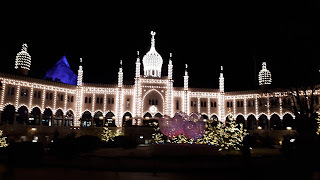 And that was the end of our trip to Copenhagen, a lovely city well worth visiting - and if you do, get a hot dog! Debbi and I flew in to Dublin airport from different UK airports (I go via the cheapest/best times place, this time it was Glasgow.) We met up at the airport and got the Air Coach into the city as there was a stop very close to our apartment. We had no problems finding it and it was really nice. We got the shopping in from a nearby Spar, then ordered a Chinese takeaway and had that with wine. It felt good to be back in Dublin, our second home! We had been due to go to our friends Ken and Elizabeth's for a meal that evening but Ken had been taken into hospital. But Elizabeth suggested meeting her at an Italian place called Bianconi's on Merrion Road near the hospital instead. It was good to see her again and we had a good chat and the food was delicious too. Afterwards we got more shopping in at a nearby Tesco's before heading home. Later Debbi went out to meet her friend Paddy, I opted out as I was tired and just wanted to chill. 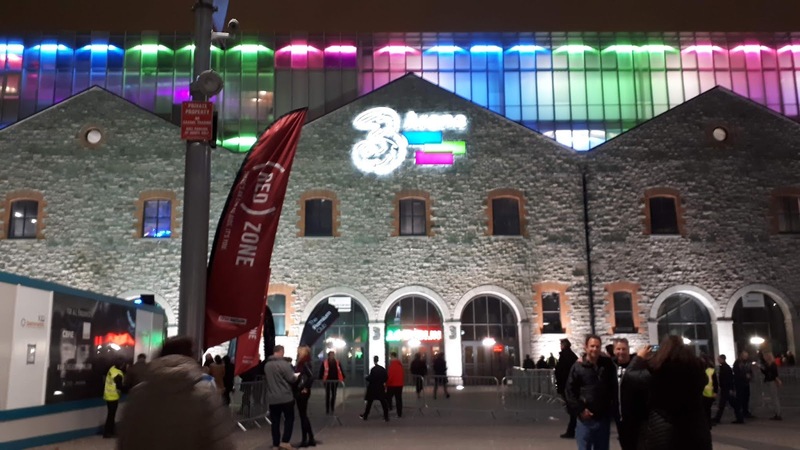 First gig today, we arrived at the 3Arena in the late afternoon. We intended having a meal at the nearby Gibson Hotel like we did last time the band played the arena, but they were not letting non-residents in. We ended up having a meal at a place called Ruby's just behind the arena which was cheap and really good. We went into the 3Arena and our seats were really good, we could see the main stage, b-stage, walkway and hanging screen. Because the arena is so small the walkway was much shorter. The show was good, the Zoo part and the new songs, which fit so well into this show, are my favourite parts. I prefer this tour to the Innocence one as it all gels together perfectly. The only downer was the crowd. I'd say most stayed sitting down, many more interested in talking or their phones than the show. Very disappointing, especially for a home crowd. 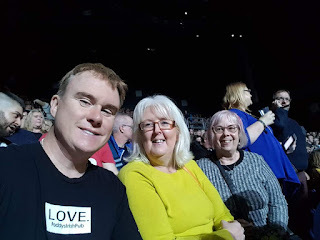 Afterwards we met up with our friends Declan (who was suffering from man flu,) Jane and Sharon and had a chat for a while, everyone had enjoyed the show. Missed my friend Dianne who had to cancel coming to Dublin just days earlier. 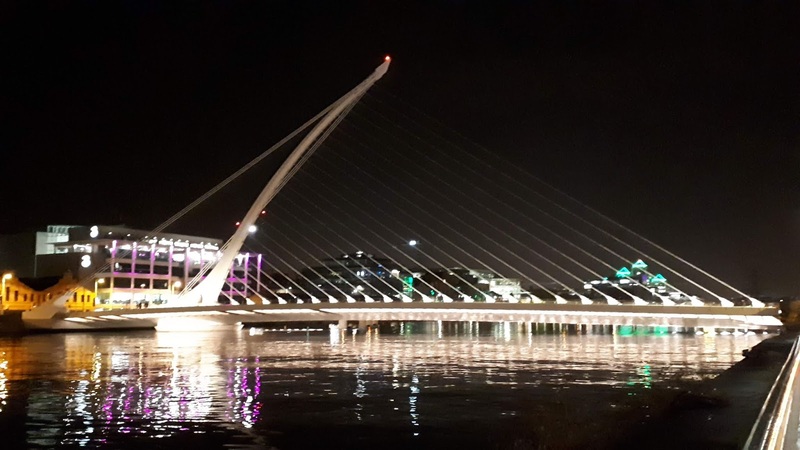 Afterwards we walked up the quay, across the Liffey and back home. Paddy came round to our flat at 2am! Good job we stay up late after shows. He recently turned 50 and we had set up a little party and gifts for him which he seemed to really appreciate. We had lots to eat and drink and there was lots of laughs and conversation putting the world to rights. Paddy left at 5am and we crashed out afterwards. We'd had a very late night so we took it easy today. For this show Debbi had a GA ticket but I had chosen to have a seat as the crowd in Dublin can be a bit "lively." It was another really good seat even though it wasn't a top price one. What a difference a day can make, the crowd around me were great, up dancing and singing along from the word go. The crowd was loud and the energy between them and the band bounced back and forth. You could tell Bono was really emotional at times, after Get Out of Your Own Way the fans kept singing long after the band has finished and he just stood smiling. It must be especially great for an artist when the audience is singing one of the new songs like that. I loved the whole show but highlights for me included the great Zoo segment, and MacPhisto's speech where he really let rip about Donald Trump. This part was also a bit more personal than it had been as Bono said that he saw his dad in him when he looked in the mirror that day and hoped that he would be proud his sons. It's amazing how different shows can feel. For me this was one of those special ones where the magic happens, where you're on an emotional rollercoaster. And it's after shows like this I know why I have been a fan of this band for 35+ years. I met up with Debbi outside the arena and she felt the same as me about the gig and loved it. We walked back home and had something to eat, wine and chilled. Our apartment is lovely but there were a couple of strange things there. One, a leprechaun hat (which explains the photo) and the other being a bottle of absinthe that was between two glass panels beside one of the doors! Today was our designated lazy day where we just mooch around where ever we are and have a few bevvies. 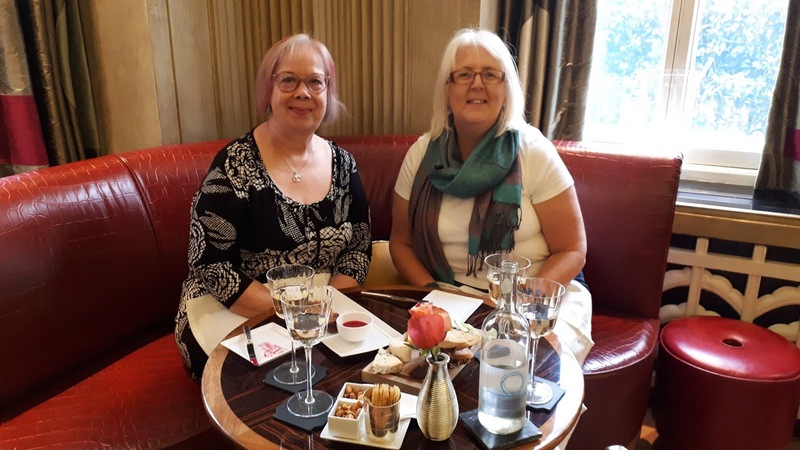 We had been due to meet up with Jane and Sharon at lunchtime but they had to cancel. We were also due to meet up with Declan that evening but he cancelled as his man flu was even worse. This was the trip of cancellations! We first went to Sam's Bar but didn't stay long as it was quiet and there was no atmosphere. 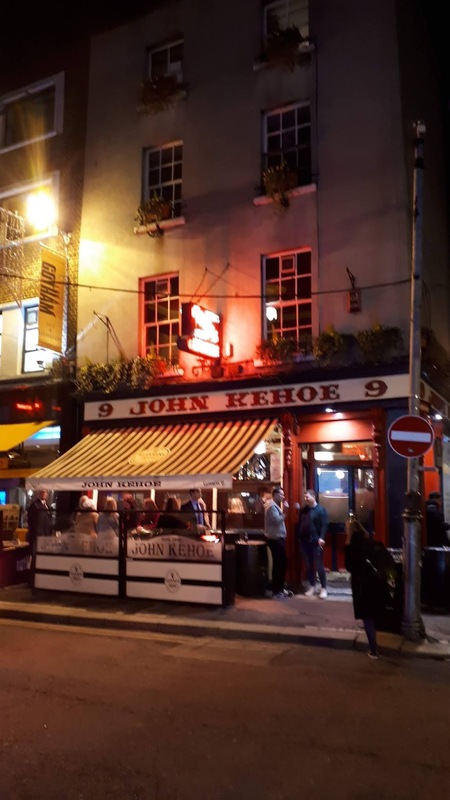 Next stop was Kehoe's which was great, it's one of our favourites. Our final port of call was O'Neill's another favourite, where we had their delicious chips and the best onion rings in the world! We took the DART to Dalkey today and had lunch in Finnegan's and then coffee in nearby Queen's. It was raining so we didn't go on to Killiney as we'd planned. That evening we went all touristy (we've been coming here so long that we don't normally do things like that) and went of the Irish Food Trail. We met our guide, Grainne, at Dublin Castle and were joined by people from Canada, America, England and Iceland who were all really nice. Our first stop was the Boxty House where we had potatoes three ways. My favourite were the boxty chips, different from normal chips and delicious. Next stop was Gallagher's where we had the choice of three mains. I chose fish and chips which were wonderful. Final place was Dakota's where we had dessert which was a Bailey's cheesecake and very good it was! 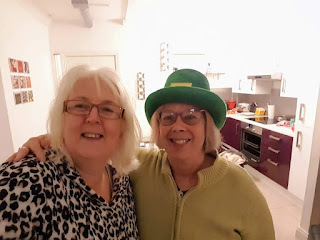 We also had a bit of fun and made our own Irish coffee, mine didn't really work out lol! All in all the tour was excellent and good value for money We learned new things about the city and its history and also sampled good food in places we'd never been to before. Grainne was a knowledgeable and friendly guide and I would definitely recommend the tour. Nasty weather today, howling wind and torrential rain so we didn't do much during the day. Later we went to a bar near the 3Arena for a meal, which was cheap and filling but not great. We met Paddy, who had our tickets, outside the arena and went in. For the third time I was able to go in without my bag being searched which I don't think is good in this day and age. Our seats were really good. I got chatting to a lovely woman beside me whose birthday it was. She had been a fan of the band since 1987. The show was good but spoiled to a degree by security making people sit down! They kind of gave up in the end as people wanted to stand. The woman beside me kept saying about Bono, "Isn't he good?" which he is! When he talked about Brexit and the hard/soft/no border she turned to me and said, "There is no them, there's only us" quoting the song Invisible which I thought was so nice. We got Dirty Day for the first time today which was a bonus. I felt a bit emotional during One as I wondered if I'd ever see the band live again. 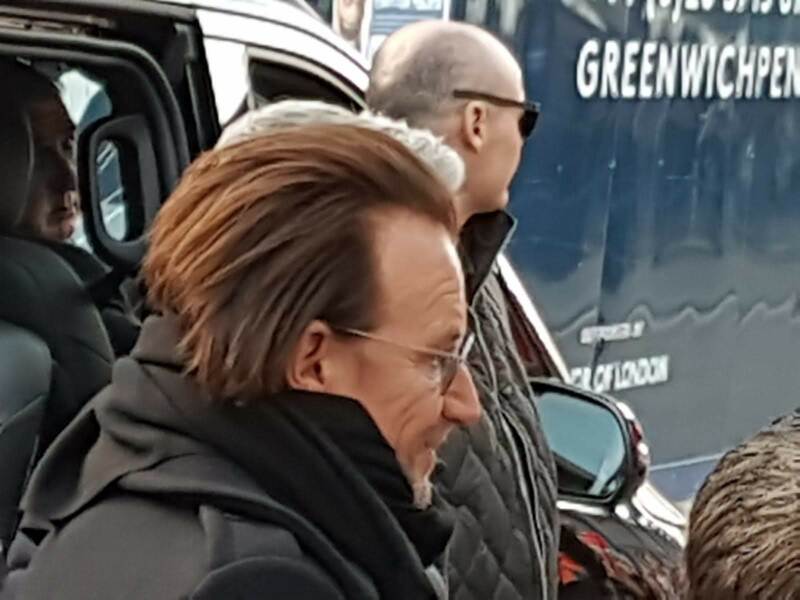 Bono looked tired and I think illness and his accidents have taken their toll on him. Plus he's said a few times that they are going away. And of course I'm not getting any younger either, I was very tired by the end of the week. We met with Declan briefly after the show, he was still suffering from man flu and chatted with him and Paddy before getting a taxi and heading home. It was the end of our week in Dublin and the tour for us. We had fun as usual, I love the touring life! We were sad it was over and can only hope there will be another tour to enjoy in the not too distant future. 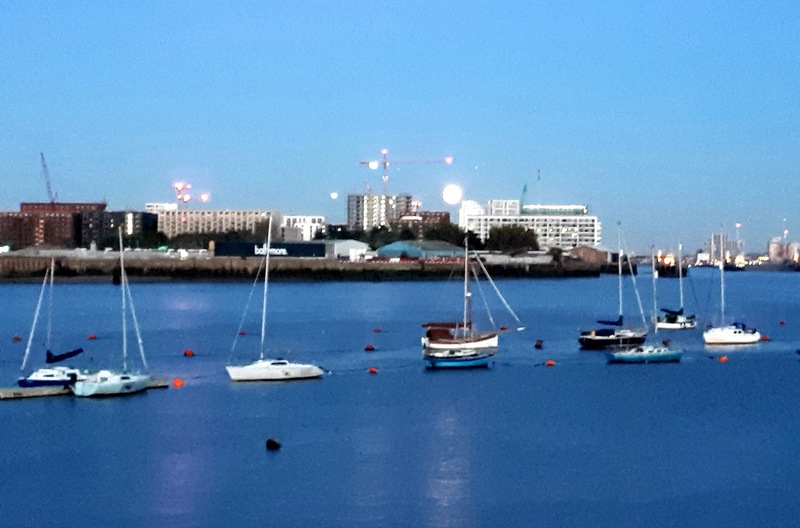 We arrived in London the day before our first concert and soon settled into our lovely apartment overlooking the Thames in Greenwich. We had a meal in the Slug and Lettuce in the O2 and finished off with macaringues which we both loved! After breakfast we went out for a walk. There was a lot of building going on and some new buildings since we'd last been there. We walked right round the O2 a pleasant walk in the sunshine. Edge looking good, me not lol! Later we went to the pier to wait for the band arriving, there weren't very many fans. The band's boat arrived and Edge was the first to come off. He was lovely, shook hands and chatted with people. Then Bono arrived and it got a bit chaotic with two big men pushing people out of the way. I just stood back then I noticed that Edge was still meeting and greeting further on so I went across said, "It's me again" and asked if I could get a photo with him. He said of course and I looked behind me thinking Debbi was behind me (to take the photo) and she wasn't. 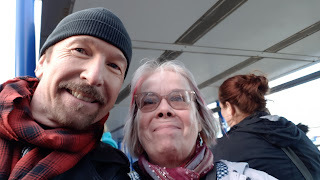 I mumbled that I wasn't very good at selfies (which is true) and Edge immediately said, "I'll do it for you" and took my phone, set it up, was impressed that I had a countdown on it and snapped the photo. I thanked him and he said, "No problem." It was a good photo of him but not so much me lol! Such a lovely man. We went back to the flat as our friend Marian was joining us there, and, after a cuppa, we all went to the O2 to find somewhere to eat. It was very busy but we managed to find a table at a place called Iguana and had a real good meal there. We then went into the arena which took a long time with all the security checks, but that's not a problem for me, it's to keep everyone safe. We had good seats on the same side as the Manchester ones but a bit higher up. Again the shows was great, the Zoo section being my favourite part. There was a slight change to it, instead of finishing that section with Stay they did Wild Horses and it was very impressive as the screen came down around them as they played and disappeared from sight. The crowd took a long time to get into the show but they eventually did. Bono managed to mess up the lyrics to One but he covered it up well lol! Afterwards we walked the short distance home (bliss after the awful hike we had last year when they played Twickenham.) We had some prosecco and chatted well into the early hours. Marian left to go home first thing, I saw her off and then went back to bed as we'd had a late night. In the afternoon we went to the pier again to see if we could meet Bono this time. There was a lovely security woman who was chatty, her main job was in social services looking after troubled children which she loved. She did the security work when she could. At one point some people who were waiting for the London Clipper boat mistakenly stood with the fans, eventually security sorted it, the boss asking us are you waiting for the clipper or ....? So funny, not really trying to keep quiet about who was coming as most security people do. Bono arrived quite late and although there were more fans they were well behaved. He looked his 58 years (he told a fan further down the queue to wash her hand after shaking his as he had a f------ virus.) He was warm and friendly as usual and shook hands with people, didn't talk much as he was saving his voice. He was soon past us and that was it. The security woman came back and she was all giddy she had spoken with Bono, Another woman who'd been on the pier had a lovely photo of her with Bono, she was giddy too lol. The effect he has on females! For this night's show we had GA tickets. Debbi went into the crowd by the b stage but I stood back a bit as I'm small and would just be looking into someones back if I was in the crowd. There was plenty of room and I could easily move if someone got in my way and I had a good view of the b-stage and screen. The show had minor changes from the previous night and the atmosphere was good. Towards the end I moved to where Bono would walk out at the end and soon Debbi was there too. Security was keeping that way clear but a woman wanted to go back in the arena and went ballistic when she wasn't allowed to. She roughly just pushed me out of the way, screamed at the security people and tried to hit one of them. Everyone tried to calm her down and she did a bit , she was standing in front of me and I asked her to move which she did. Security ended up letting her back in which I thought was wrong as it only encourages that kind of terrible behaviour. Anyway, Bono passed right by us shortly afterwards as he left the arena and that was the end of the London shows. I'd been a bit concerned about having GA for the show as I'm not a spring chicken anymore but I was fine, I think it helps if you can walk about a bit and lean on things. Once home we had a few drinks, pizza and chatted much of the night away. I love when we are on tour like this! We had decided to have another day in London after the shows as we wanted to do our usual afternoon in Claridges which had become a bit of a tradition for us when visiting the city. We had sharing platters of duck spring rolls and cheese and biscuits washed down with a lovely bottle of white wine. The bar is very relaxed and not snobby at all and you are well looked after without the service being over-bearing. We stayed for three hours and thoroughly enjoyed it. It was a great way to end our visit to London, next stop Dublin! 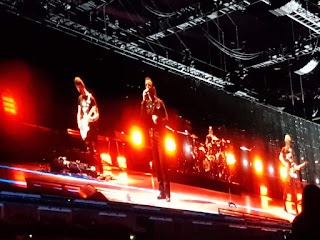 U2 Experience and Innocence Tour, Manchester 19th October 2018. Finally got round to updating my blog! I just haven't been into writing it recently but now am ready to catch up with all I have been doing in the last few months. Debbi and I met up at Piccadilly station and went to our favourite Thai restaurant for a late lunch. We then went to our hotel, the Trivelles, which was a bit out of the centre but near Salford Crescent station. It wasn't the best of hotels, but it was cheap. Later we headed to the Metro Arena and took our seats. It was a bit thought provoking going there after the awful terrorist incidents when so many young people lost their lives not that long ago. We had good seats on Edge's side. The set up was much like the Innocence tour, main stage, central walkway that ran almost the full length of the floor with an equally long screen above, then at the end of that a round b stage. The band's entry was low key, they just walked out onto the stage and immediately went into The Blackout, which really rocked and I liked it much more live than on the album. 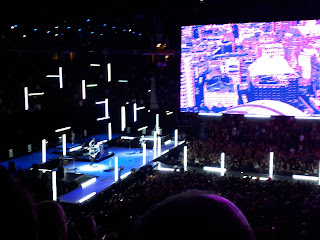 I was surprised how emotional I suddenly felt, the power of U2 live is stunning. This was followed by Lights of Home, then two oldies, I Will Follow and Gloria that were very well received, then Beautiful Day which I can do without nowadays. 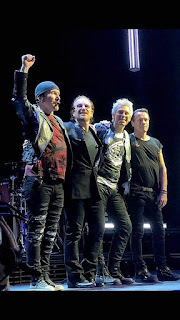 Then screen sprung into life and lowered and much to my surprise Edge's unmistakable intro chords to Zoo Station blasted out and Bono did the "puppet" dance as I call it (those who saw the band in the Zoo days will know what I mean!) and walked onto the walkway to sing Zoo Station, it rocked, absolutely loved this version. Again I was overcome with emotion, so many great memories flooded back, and to hear this song after so long took me right back to great times. This was followed by Stay, Who's Gonna Ride your Wild Horses and The Fly. It was just wonderful and this Zoo segment was the highlight of the show for me. I could hardly believe I was hearing these songs again. It also made me realise what amazing songs they were. Bono was in good voice and there was a lot of energy. There was a short intermission and when the band came back on they went onto the b stage and went into Elevation, Vertigo and others. At one point Bono once more becomes MacPhisto, his best ever character, this time his make up was digital and it worked quite well the older version with proper makeup. MacPhisto was as evil as ever, good to see the old man again. The band then went into Acrobat which again was a surprise for me, what a great song that is. It was followed by a beautiful acoustic You're the Best Thing About Me. The rest of the show was a mix of old and new songs, well put together. 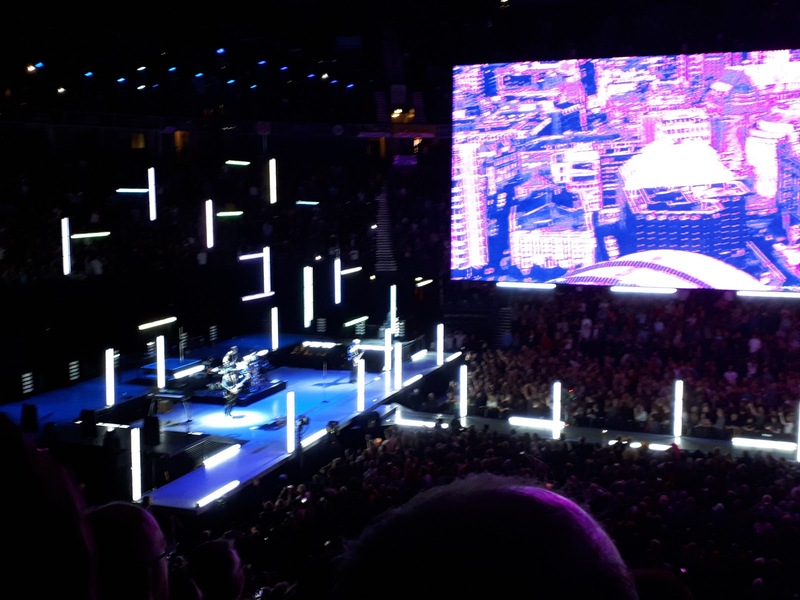 The show had, as usual with U2, a low-key ending with the beautiful 13 (There is a Light.) Where Bono stayed on the b stage while the others disappear along the walkway into the darkness. There's a model of his childhood home on the stage and he opens the roof and out comes a light bulb symbolising the light bulb in his childhood bedroom,which he swings before leaving the stage through the crowd. An echo of the Innocence tour where the light bulb makes an appearance near the beginning of the show, everything has come full circle. The screen throughout the show was stunning and at times simply beautiful. It didn't take away from the music, it complemented it perfectly. I thought the screen and stages were used to a better advantage than on the Innocence tour. It all flowed perfectly and our seats enabled us to see it all very well. Afterwards we headed back to our hotel, and picked up a Maccy D from the place opposite our hotel. We had it with a bottle of champagne we had, strange combination but it went down well! First show done, and we were not disappointed, there was another show in Manchester the following night but we were not going to that one, London and Dublin were our next shows. 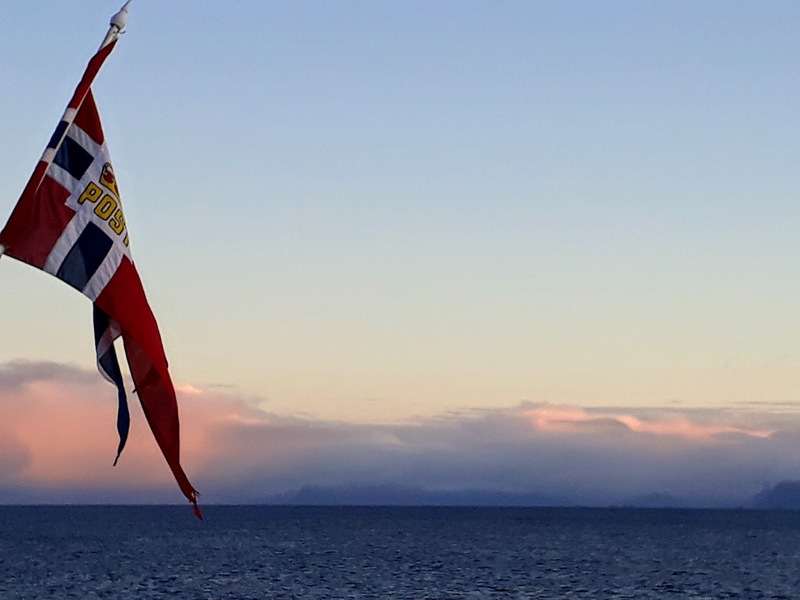 We crossed the Arctic Circle once more at 9.15am and much of the day was spent at sea there were stops but only for very short periods so we could not go ashore. Natasa gave a talk on Mythical Creatures of the Sea which was fascinating. 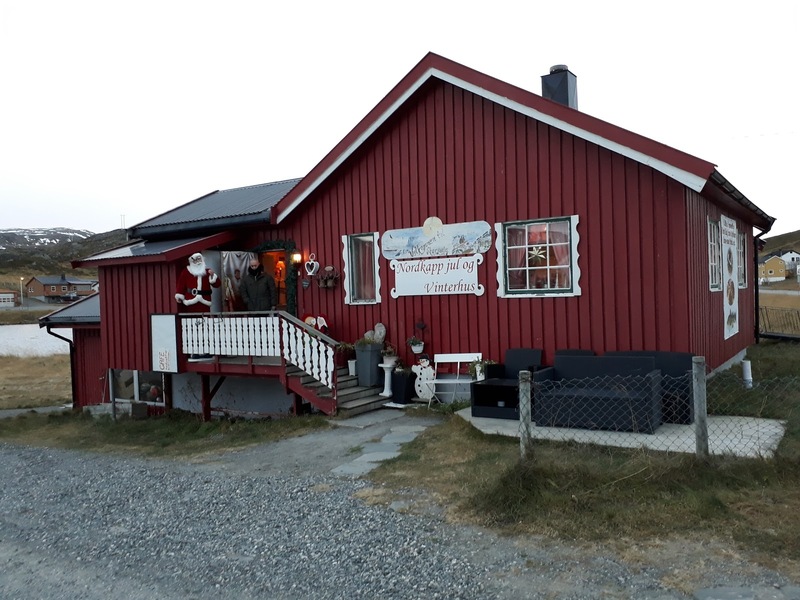 We arrived at Brønnøysund at 3.45pm and as there is a stop of one and a quarter hours we decided to go ashore to go to a small shopping centre that had a branch of a cheap Christmas shop we'd been in at Hammerfest as we wanted to buy something. Quite a few people got off with us and headed the same way. The weather was atrocious, howling wind and driving rain, but the centre was not far away and it was a relief to stumble into the shelter and warmth of the shops. We bought a few things in the Christmas shop and looked around some others before heading back to the Nordnorge. 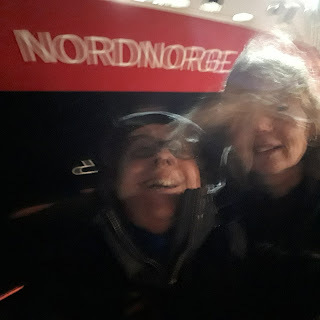 We tried to do a selfie with the ship in the background but it was so windy I couldn't hold the camera straight and, as my mother used to say, every picture tells a story! really lovely, very warm and friendly as the staff had been throughout our voyage. The meal, as ever, was delicious and we had the best dessert of the trip, "success tart" which was absolutely gorgeous - everyone was loving it! That evening we just relaxed in the panoramic lounge, chatting and drinking the expensive wine very slowly. 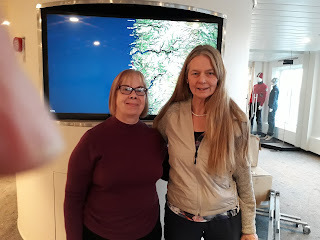 Our last full day onboard the Nordnorge and I felt sad that the trip was coming to an end. 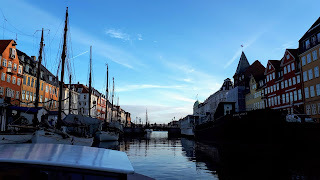 We had a stop for a few hours in Trondheim, but it started at 6.30am and finished at 10am so we didn't go ashore, we had been on a tour of the city on our way north anyway. We had our last meeting with Bjorn and David where they told us a bit about the shifts the staff work (22 days on then 22 days off) and arrangements for our departure the following day. They also told us that it would get very choppy later in the night. That evening Bjorn held a quiz about Norway in the panoramic lounge and Marian and I won it! Considering some of the teams were six people strong I think we did very well! Our prize was one of the smart Scandinavian design water carafes each they used in the restaurant which we were both very happy with. We went back to our cabin but had barely got in bed when the ship started to go through the storm and there was no way we could sleep then! 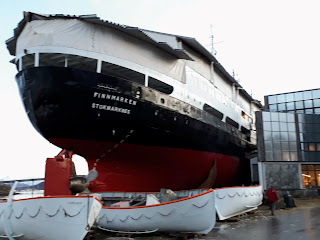 The ship was tossed around by the storm until about 4am when things calmed down and we were able to get a bit of sleep, luckily neither of us got seasick. We had to be out of our cabin by 10am but there were plenty of areas we could sit in, the ship was much quieter since the Germans had left yesterday. We had our last buffet lunch, I was starting to get used to having all this great food made for me. I went out on deck to watch us head in towards Bergen and soon we were docked at the Hurtigruten Terminal. We arrived late due to the storm in the early hours. We left the ship and got the bus to the airport. Bergen Airport is a strange place. It's not very big and has no proper place to eat or drink. Everything is self service and the shops are few and not very interesting, I remembered Bjorn had said there wasn't much at the airport in the meeting the previous day, he wasn't joking! So that was it, the end of a fantastic experience, I absolutely loved it all. Norway is a stunningly beautiful country with lovely people, I felt very at home there. The Nordnorge was just the right size of ship for me, and it's staff were wonderful. Apparently Hurtigruten staff are well paid and there is a no tipping policy, though if you wanted you could leave something when you left. Nothing was ever too much bother for them and they went out of their way to talk to passengers. The food was amazing and some very seasoned cruise travellers we talked to were very impressed by the food and voyage in general. I loved the fact the ship was a working ship and we were on a journey not a cruise. There is always something to see and I loved how you could just hop off the ship at the ports if you wanted. Sometimes we'd stop at some tiny place where, as well as goods and post, people, sometimes just one person, would get on or off, sometimes a car waiting to pick them up. Marian said it would make a good storyline for a book, the stories of these people where they had been, where they were going, what they had done. Favourite events/places? I loved the tour I went on way up north to the winter/Christmas house in Skarsvag and the gallery in Kamovaer. 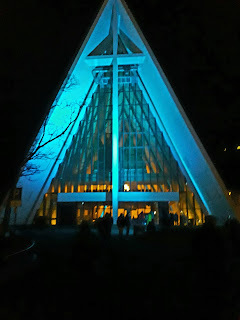 The Midnight Concert in the Arctic Cathedral in Tromso was so beautiful. 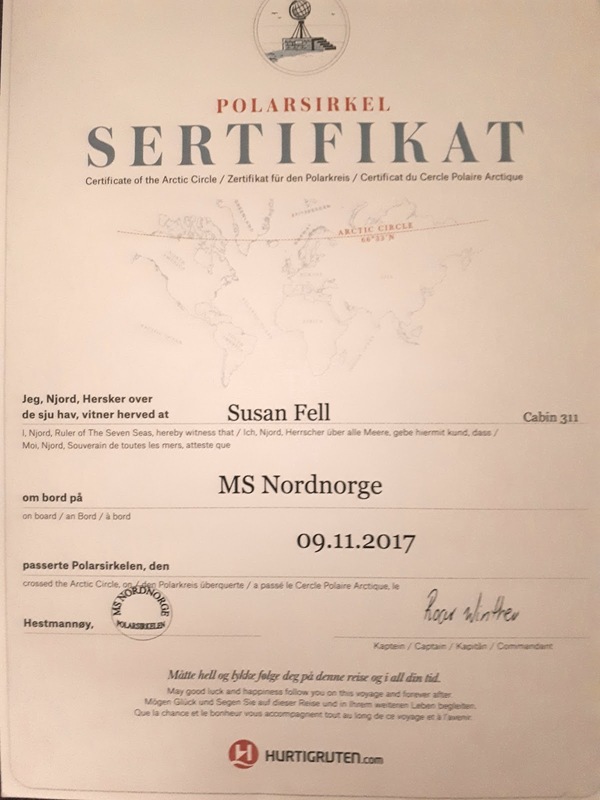 And I'll never forget travelling along Vestfjord balancing against the window so I didn't have to test out my survival suit in the icy water, looking up at the vivid green ribbon of northern lights as they danced above the fjord. The only disappointment being that there was not enough snow to be able to go husky sledding in Kirkenes. Winning the quiz was a perfect ending to our trip. 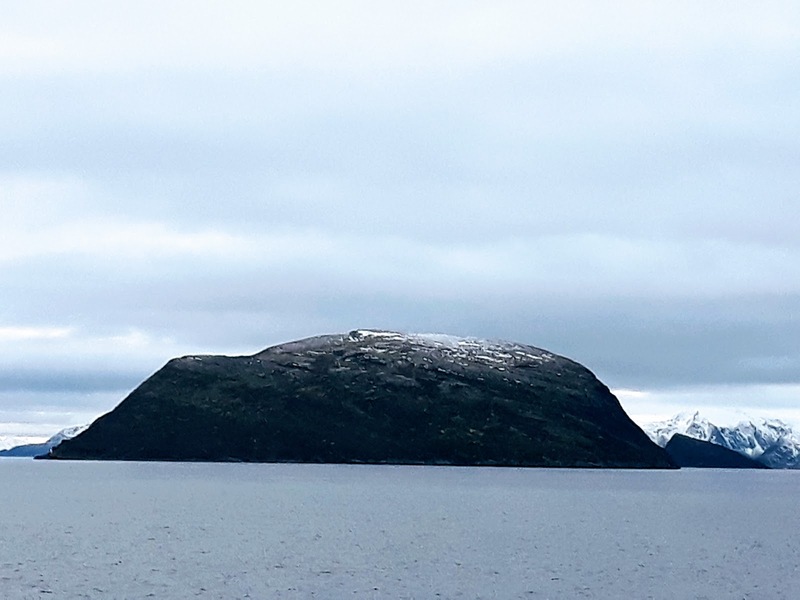 I would highly recommend sailing with Hurtigruten, especially if you want a trip that is a bit different. I will be doing another voyage with them, maybe in the spring to see another side of Norway. 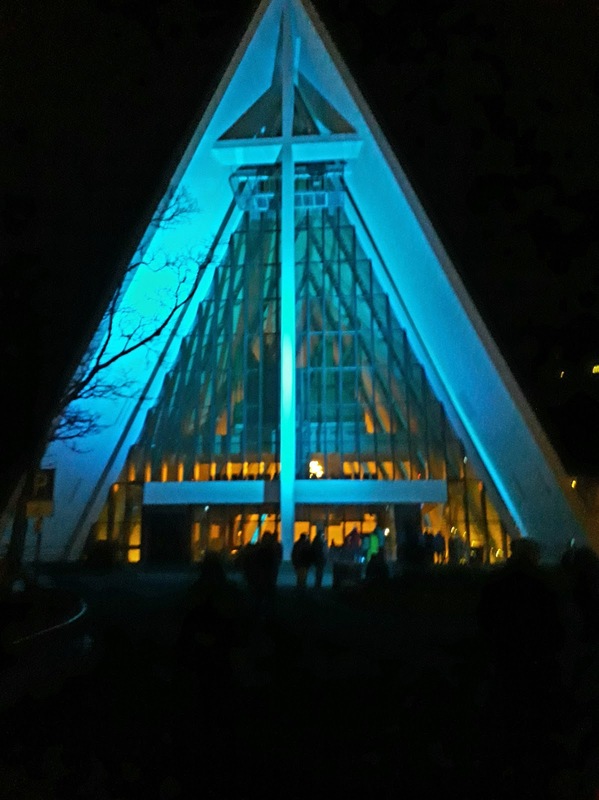 We arrived in Tromsø just before midnight and those of us who were going to the Midnight Concert in the Arctic Cathedral headed off on a coach. We could see it all lit up in a blue light on other side of strait linked to the island of Tromsoya by a long and elegant bridge. The cathedral was completed in 1965 and, like a lot of churches here, is triangular in shape. Inside it has A large triangular stained glass window and at the other end organ pipes. Otherwise in true Scandinavian style minimal decoration. The performers were a singer, flautist and a piano player. Their performance was absolutely beautiful, the acoustics in the cathedral were amazing the singer's voice soared throughout the building and gave me goosebumps. The music was a mixture of traditional, classical and they finished off with Auld Langs Syne which brought a tear to my eye! Absolutely loved the concert and would recommend anyone to go to it. We got back to the ship at about 1.15am and the Nordnorge soon set sail once more. I stood on deck as we left the city watching the lights slip away into the darkness. Tromsø was like being back in civilisation once more even though we were still well above the Arctic Circle. It was a city I always wanted to visit and it looked lovely and I would love to visit it again but in day light! 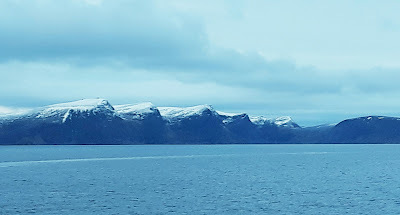 Next day we were sailing south passing through stunningly beautiful landscape towards the Lofoten Islands, I love the easy going life of this ship and what views we had! Later we had a talk on the history of the Hurtigruten shipping line. In the 1890's it took mail many weeks to reach Hammerfest from Trondheim. A tender was put out for a service that could provide faster services to the coastal communities. Richard With, a very experienced captain, accepted the challenge and did the route in just 67 hours. He named the shipping company he set up Hurtigruten which translates as the "fast route". 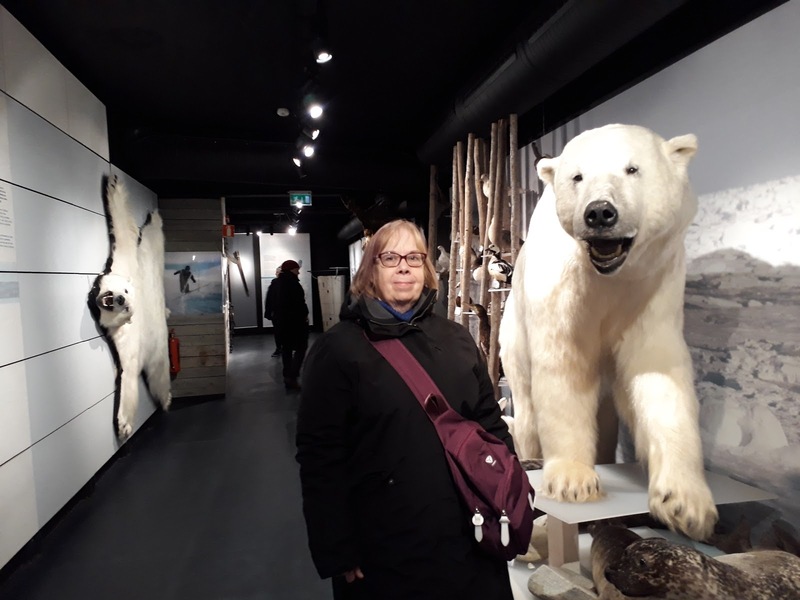 We arrived in Stokmarnes and had time to leave the ship and visit the nearby Hurtigruten Museum. The ground was like an ice rink and a couple of people fell. We managed to get there in one piece and it was a fascinating place to look around. Outside, and also part of the museum, (you could go into it) was an old ship Finnmarken, it looked really impressive. Afterwards we gingerly made our way over the ice again to the ship and made it there in one piece! 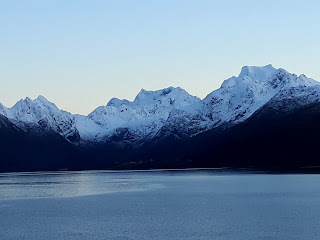 There was a meet up on the deck later for hot chocolate and brandy as we went into the entrance of Trollfjord and the spotlights lit up the massive sheer sides of the fjord. It seemed strange but nice drinking the yummy drink out of special Trollfjord mugs (which you could buy - we did) while Abba was singing Dancing Queen and everyone chatting at the mouth of the fjord. Afterwards the ship made its way through the Lofoten Islands. The only downside was it was dark so we couldn't see the beautiful scenery we knew was there. Our next stop was at Svolvaer, where we'd been soaked to the skin on the way north! 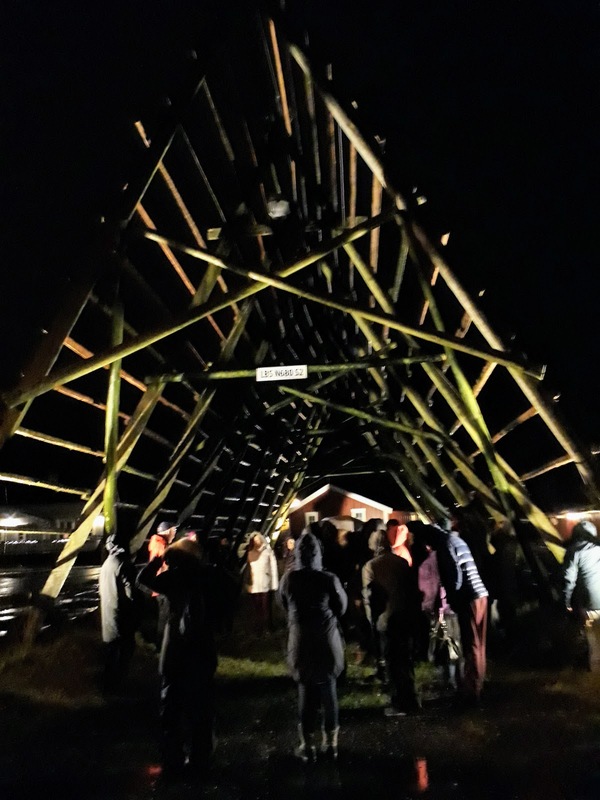 This time we went on a tour to look at the huts and A-frames used by fishermen in the past. 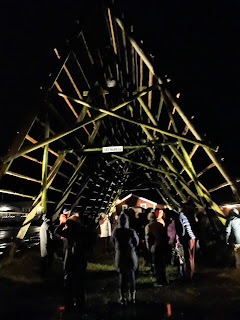 We were taken by bus a short distance and walked to a large A-frame or hjell as they are called in Norway. These frames were and still are used to dry cod, it is hung on the frames and dries out naturally in the cold, dry air for three months. The end result is called stockfish and can be stored for years. Stockfish is Norway's oldest export and today big importers of the fish are African nations and Italy. We then went into a small wooden hut that had all the things in it that would have been there when it was in use. Up to 15 men lived in the small space there during the fishing season. As we entered the hut a man had a bowl full of dried stockfish and offered us some. It was brown and tough as old boots, after trying the soften it in my mouth for ten minutes I gave up and spat it into a hankie and put it into my bag (next morning my bag stunk of it and it took ages to disperse lol!) We had a talk about the lives and work of the fishermen and boy they had a hard life! After that we went to the Gunnar Berg Gallery which was very close by. Berg was born in Svolvaer, trained in Germany and lived much of his life there. But he came home to Lofoten during the fishing season and painted many paintings of the landscape, fishing fleets and day to day life of the area. His paintings were beautiful, he was only 30 when he died, it makes you wonder what else he could have produced had he lived longer. We then went to visit a small hotel that has a shop beside its reception that is preserved from around 100 years ago. Fascinating to look around. And if I remember rightly it was owned by Berg family members. We had the best cod I have ever had for our evening meal, huge tasty flakes steamed in a white sauce, beautiful! Good to have fish not in batter or breadcrumbs. The food on this ship is fantastic and healthy. 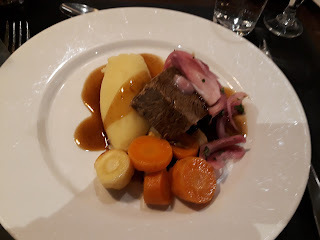 Lots of fish (but also lots of other things for people who don't care for fish), hardly anything fried, chips never served once, tasty potatoes, and lots of delicious berries in the desserts, sauces you could put over desserts and also sometimes with the main course. Loved it! We'd had a busy day so just spent the evening relaxing in our favourite lounge, drinking the expensive wine, very slowly lol! Really enjoyed the day though and was beginning to get sad that the end of the trip was not very far off. Today we arrived at Kirkenes, 955 miles from Bergen, further east than Istanbul, as far north as northern Alaska and just 10 miles from the Russian border and the point at which our ship would turn around and head on back down the Norwegian coast. Marian and I had been due to go on a husky sledding trip here but it was cancelled due to there being no snow. I was very disappointed as it was one of the main things I was looking forward to on this trip, but you can't control nature. So Marian opted for a hike and I walked into the town from the harbour which wasn't far. The place was bleak and quiet, (it was a Sunday and in Norway everything is closed) and I had to watch how I walked as it was icy. I had my ice grips on but they made me walk really funny and didn't help much, apparently the chain ones are best. It was cold but I found that the dry cold they have there doesn't feel as cold as I expected. I saw a supermarket which had it name in Norwegian and Russian, quite a few Russians live in the town. This area was occupied by the Germans in World War Two and when they left they burned almost all the buildings (something that happened in many of the Norwegian coastal towns.) Apparently it had also been a crossing point for Syrian people entering the country which is strange in such an isolated, northerly place. To be honest on my little walk there wasn't much to see in Kirkenes, but some of the things it is famous for were not happening (sledding, the Snow Hotel) due to no snow. As I got back to the harbour I noticed a rock that had lots of little stones on top of it, so I added one to it, it seemed to be the thing to do. In the afternoon we had a talk from Natasa about the Vardo witch Trials which was one of the biggest witch trials in Scandinavia and took place in 1621. It resulted in 91 people being burned at the stake. The ship set sail from Kirkenes and in a short time docked in Vardø. There we could disembark and see the place the trials were held and a memorial to those who died. The trial took place at the Vardøhus Fortress which was a five minute walk from the ship. It was dark and the icy wind howled in from the Barents Sea, I was glad to have the torch on my phone to see where I was going. Some people stopped at the fortress and others, including Marian, went on to the memorial, there wasn't time to do both. The fortress was octagonal in shape and made up of small turf-roofed houses in which there were militaria exhibits. One we were inside the fortress walls there was a bit of shelter from the wind and I wandered through the little houses. 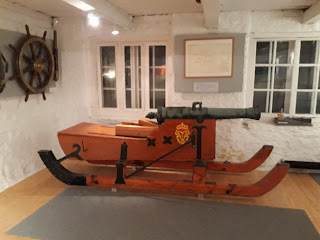 In one there was a cannon on a sledge which makes perfect sense for this area. It was a small museum but it was interesting. Marian said Steilneset Memorial was impressive. It is made up of two parts, a cocoon-like structure mounted on A-frame like structures. You can go inside and in there are lamps by small windows each lamp representing one of the people who was burned at the stake after the witch trials, beside each one is a little information about each person. The other part of the memorial is an eternal flame that burns through a chair and is reflected by mirrors. It was good to get out of the wild and icy weather and into the welcoming warmth of the Nordnorge. We went to the talk by Bjorn and David which was as entertaining as ever. I learned that during hibernation bears do not urinate, urine produced is converted into amino acids that stop their muscles from wasting away during their long sleep, amazing! We also learned that house prices in this area are cheap but if you go to Tromso or Bergen they are very expensive. That evening we had reindeer (this being the area where the herds of reindeer range) for our evening meal and it was lovely. Later the staff put on a tongue-in-cheek fashion show of items from the shop, some of them really got into it and it was fun, the crew are lovely..
We sailed past an island called Håja that sat in the sea like a huge whale. Once past this island you see Hammerfest which claims to be the most northerly town in the world. Once docked we disembarked and first went to a pharmacy to buy some (very expensive) cream for my eczema which had flared up. The pharmacist told me that the air is so dry there that you must keep skin well moisturised. We then popped into a nearby art gallery but it wasn't really our cup of tea. Nearby was The Royal and Ancient Polar Bear Society which housed a small museum and rather good little shop. The museum depicted the history of Hammerfest, and the hunting and fishing that once made this town a very busy port. It was also full of stuffed animals including an eagle, walrus and polar bear. Some of the old photos were really interesting. Seeing we had time to spare after looking around the museum we walked the short distance to the church. It was built in 1961 (Hammerfest was another Norwegian town that was burned by the Germans when they left) and had a beautiful triangular stained glass window and wooden panels painted by local artists. 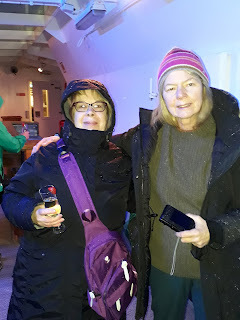 We both liked Hammerfest, it still felt very Arctic and it had a good feel about it. We headed back to the Nordnorge and I went out on deck and watched Hammerfest disappear behind Haja once more. 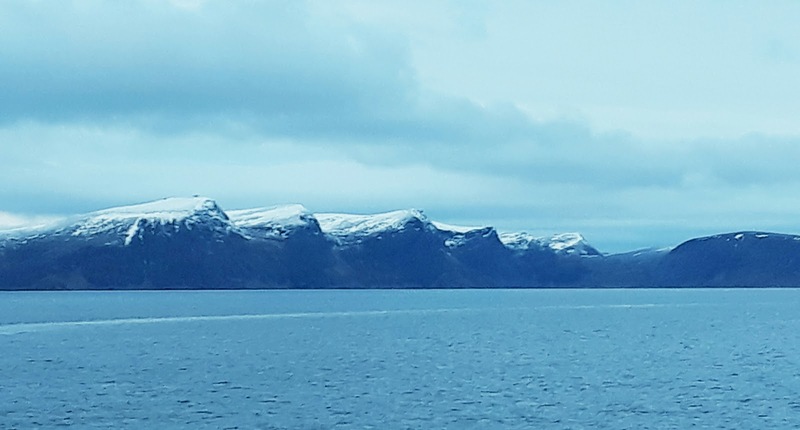 The scenery was stunning as we headed south once more towards our next port of call, Tromso. The morning was spent relaxing and admiring the beautiful views of snowy mountains as they passed by, I love the relaxed way of life of the ship that by now we were well into. In the afternoon I went to a lecture about Norwegian explorers of the Arctic and Antarctic. It was dark by time the ship docked in Tromsø. Tromsø is a place I have always wanted to visit, the setting is so beautiful. But unfortunately as it was dark I couldn't see that. 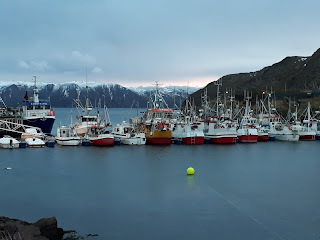 Marian and I were booked on a whale watching trip in nearby Vestfjord - yes I know that sounds weird to do at night, but the boats are fitted with spotlights so you can see the whales if they are around. We got a bus to a small village and went into a small place where we changed into survival suits all ready for the trip. We got on the small boat and off we went. There were drinks provided plus lovely cinnamon cakes and biscuits. After a while I went to join some others who had gone onto the viewing deck. To do so I had to squeeze up a steep flights of steps and onto the deck which didn't really have anything to hold onto! The rails were very low and there were no seats, scary! Like a few others in order to feel stable and safe, I leaned back on a window and stayed there as the boat flew along the fjord at quite a pace, I hoped that I wouldn't need the survival suit lol!. Unfortunately there were no shoals of herring showing on the radar which meant there were no whales. But while we were on deck we saw a beautiful aurora. 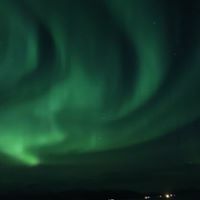 It was vivid green and was directly overhead and stretched like a ribbon above the fjord and snow covered mountain tops, twisting and twirling along itself. For me it made up for not seeing the whales. I was relieved to squeeze down the steep steps and back into the warmth and safety of the cabin. Later as the Nordnorge left Tromsø I stood on deck, the city swith it's sparkling light looked beautiful. Snow started to fall as the lights slipped away and I thought how lucky I was to be able to come on a trip like this. Ever north we go, I loved seeing all the new places we stopped at, and watching locals getting on and off. Supplies were loaded and unloaded. Cars waiting in tiny Arctic villages to pick up a loved one, I wondered what their stories were. 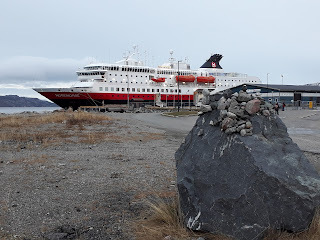 The Hurtigruten ships are especially vital to this part of the country, where roads are not a viable transport system in the winter. Even small places have airports, again vital for these areas, but they too can fall prey to the Arctic winter. There are 12 Hurtigruten ships that sail up and down the coast 365 days of the year. Today our main stop was Honningsvåg on the island of Magerøya which is almost the most northerly point Europe. Marian had opted to go on a trip to the northernmost place in Europe, the North Cape while I went on a trip to two fishing villages. It was very cold here but it was bright and sunny. 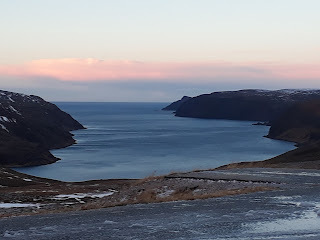 We drove for about 20 minutes along narrow icy roads, hairpin bends and over a mountain before arriving at a small village called Skarsvåg where we visited the Winter and Christmas House. The small shop and cafe is run by a lady called Heidi who was born and raised in Skarsvåg. First we sat in the cafe area where she had traditional Norwegian Christmas fayre, mulled wine, coffee, waffles, Christmas cake and cinnamon biscuits, it was very snug and cosy. She talked about the changing fortunes of the area, a lot of the young are leaving. Her husband is a king crab fisherman and you can make a good living doing that. She and a few other ladies from the village get together once a week and knit various items in the traditional style which she sells in her shop. She was very passionate about her village and its traditions. The sun will not rise above the horizon here from November 21st to January 21st, but there is a winter blue light for a while each day. She also said that you have to have plenty of firewood in stock for when the electricity goes off in the winter. You also need to be well stocked up on food as they are often snowed in as well. I bought some mittens knitted by the ladies and she thanked me for supporting their work. We left the snug Christmas House and the Arctic cold hit me, onto the bus and off to the next visit which is the village of Kamoyvaer where we visited the East of the Sun Gallery. 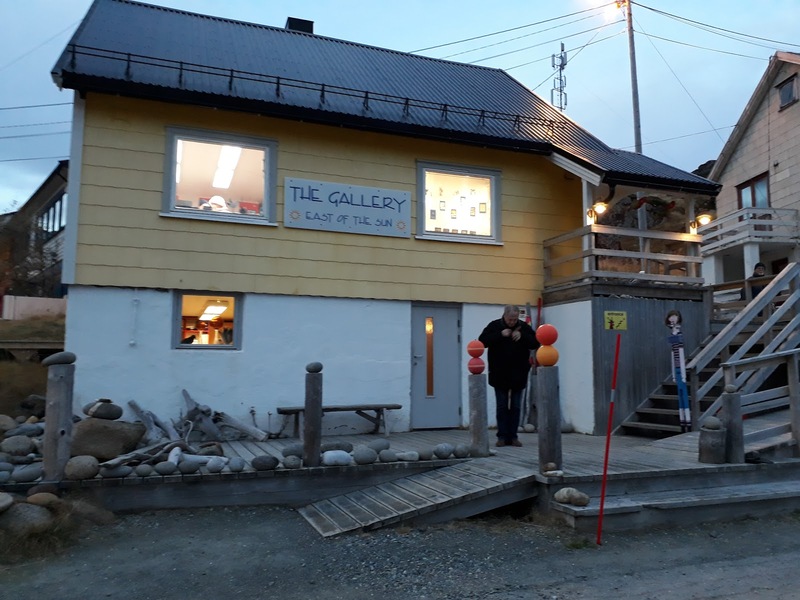 This is the gallery of Eva Schmutterer from Germany who came to Kamoyvaer many years ago after meeting and marrying a Norwegian from the area. She was inspired by the amazing landscape and wildlife of the region and produces amazing paper collages. I loved her work and it was very reasonably priced so I bought three prints. I had a little wander around the village afterwards, it was very isolated and it felt really Arctic. Places like Tromso didn't feel really Arctic to me but here it did, as fascinating as I found it I couldn't live here. The trip back to the Nordnorge was in the dark and once again it was lovely to feel the warmth of the ship again. Later that day we had a talk on the Sami culture which was enlightening. Many of the Sami people live a nomadic life across the northern areas of Norway, Sweden, Finland and Russia and at this time of year are in the east so we wouldn't be seeing any Sami or reindeer. We had the usual talk from Bjorn and David and learned that gulls drink seawater and filter the salt out through glands in the head and the salt is excreted through their noses - nature is amazing! That evening we relaxed in the lounge on deck seven, my favourite place on the ship. It was quite stormy, after all we were now well into the Arctic on the Barents Sea, 742 miles north of the Arctic Circle. The easy going life on a ship is deceptive, you are travelling in wild waters and further than you realise. called Nidaros and is over 1000 years old. 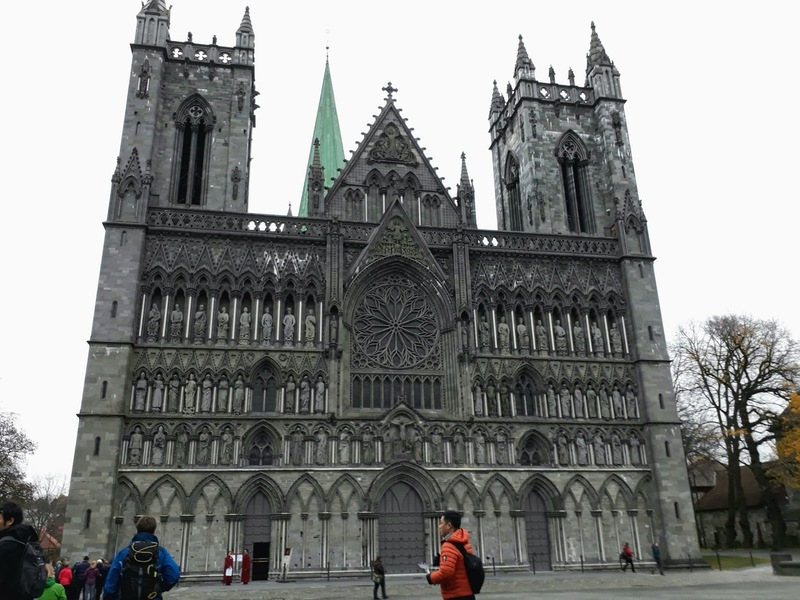 The cathedral bears the old city's name and is not at all of the usual Scandinavian style, it is more Italianate in style and it is the northernmost medieval cathedral in the world. We went inside and had a short guided tour which was fascinating. We then went on to a viewpoint that looked out over the the city and the fjord. 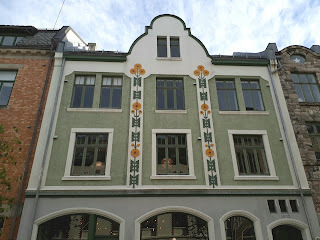 We saw the brightly coloured warehouses along the banks of the River Nidelva that are now exclusive homes and shops. 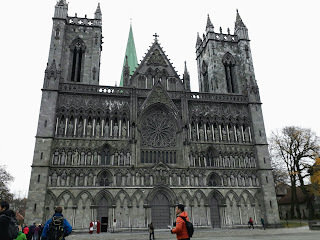 Trondheim seemed a lovely city and I really enjoyed the tour. 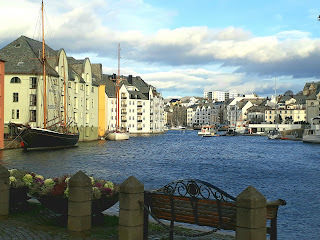 We went back to the Nordnorge and set off along Trondheim Fjord and ever northerly. Later in the afternoon Natasa gave an interesting lecture on how the Norwegian landscape was formed. I've always been interested in geology and so really enjoyed the talk. Later Bjorn and David gave their talk which was as entertaining and informative as usual. After another delicious evening meal we just chilled in the panoramic lounge on deck seven, love this life! the earliest I've ever drunk alcohol! Later the winner of the competition to guess the exact moment we entered the Arctic was "baptised" with ice put down his back! The winner also received a Norwegian flag signed by the crew. Others could also be baptised and got a free glass of cloudberry wine. It was a bit of fun and was just one of the onboard events that made this trip such an easygoing, fun eperience. Funnily enough after entering the Arctic the landscape became more dramatic, snowcapped, jagged mountains and huge monolithic-type mountains jutting out of the sea like huge whales. Our main stop today was Bodø, Marian went on another hike and I walked into the town to explore. To be honest I wasn't very impressed, there wasn't a lot to see there. I wandered about for an hour before returning to the ship. Marian returned from the hike which she had enjoyed. 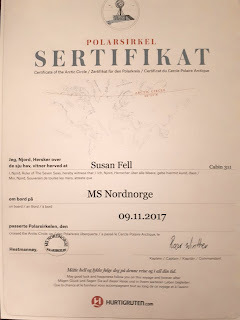 When we returned to our cabin we found a certificate confirming our passing into the Arctic signed by the captain who was called the wonderful name of Roar Winther. 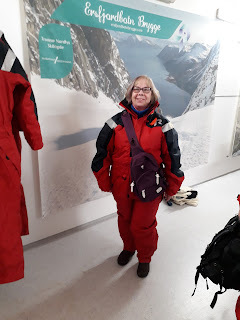 I later went to a lecture about Vestfjord and Trollfjord given by Natasa, then the usual information talk by Bjorn and David which included eider ducks, and snowart. Each of their talks finishes with some Norwegian music and art, which so far has been lovely. Our evening meal was fabulous tonight. Each evening the meal is comprised of specialities of the area we are passing through. Today we had the tenderest beef I've ever had from Trondelag. Dessert was chocolate parfait with a rhubarb compote, sounds like a strange combination but it worked perfectly. Rhubarb is one of the first crops to start growing after the snow melts so it is viewed as a reminder that the winter is passing and summer is ahead. We had a longish stop at Svolvær in the Lofoten Islands so, even though it was dark, we decided to go ashore and explore. There was a boardwalk that skirted the water so we walked along that passing lovely looking bars and restaurants. After a while the heavens opened and the rain poured down, I could hardly see where as I was going as my glasses were full of water. Luckily my coat was waterproof and long but my boots were sodden in no time. 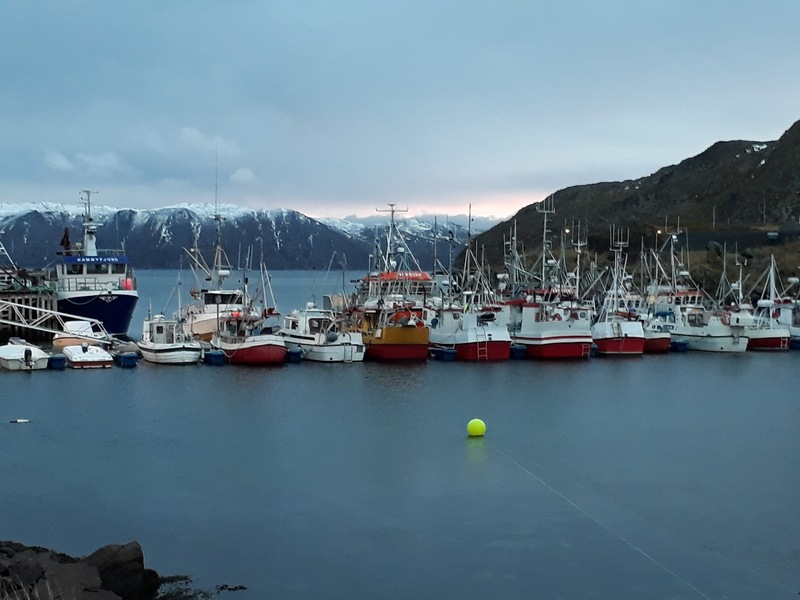 It was a relief to walk up the gangway and get out of that rain and feel the welcoming heat of the Nordnorge. We dried out and went up to our favourite lounge to relax. We stayed there until we reached Trollfjord which we could not enter as it is too dangerous to do so at night as much of it is very narrow. But the captain went into the mouth of the fjord and shone spotlights on the sheer cliffs so we could see a little of it. The rain was still pouring and we could see waterfalls running down the rocks. The entrance to the fjord is very narrow and it was an amazing feat of steering to give us a peek of this place. For many years I had wanted to go on this trip and when I saw it at a bargain price I jumped at the chance to go on what is advertised as the world's most beautiful voyage - and I wasn't disappointed. We flew to Bergen and from there were transported to the Hurtigruten Terminal where we did a smooth and well organised check-in. Afterwards we were free to go on board the ship, we couldn't yet go to our cabins so we explored. Hurtigruten ships are not cruise ships, they are a vital part of daily routine up and down the coast of Norway. They deliver and take on supplies, post and local passengers during the 34 stops going north and 33 south, they are working ships. 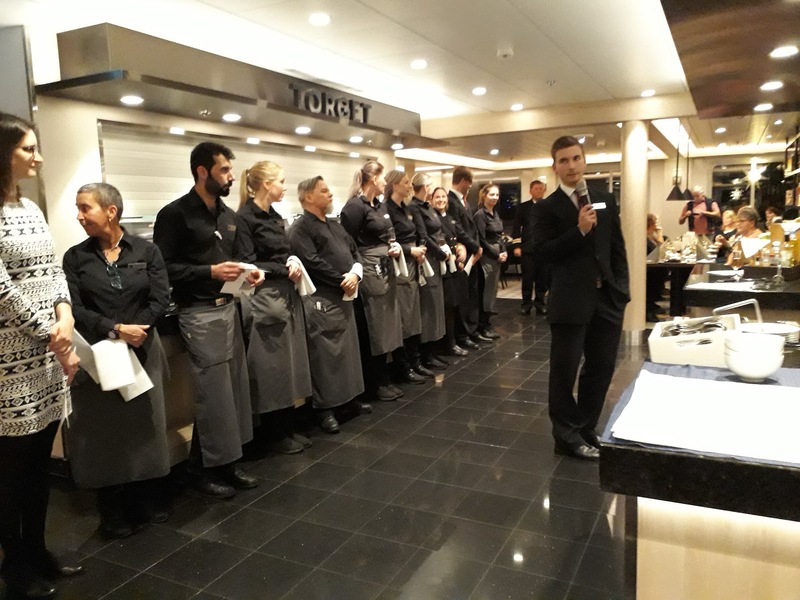 But having said that the seven decks were beautifully fitted out with a lovely restaurant, two small cafes and a bar in the panorama deck which has the most comfortable seats in the world! There was also a shop, reception, expedition desk where trips are booked and information given. There is also a small gym, sauna and a jacuzzi on deck. At 6pm we were able to go into the cabin which was small with a square porthole, very clean and had all we needed. We then went to the Torget restaurant for the evening buffet which had everything under the sun and was absolutely amazing! Later there was a meeting with the friendly expedition team, Bjorn, David and Natasa who gave us all the basic information for our trip and what to expect on the voyage. 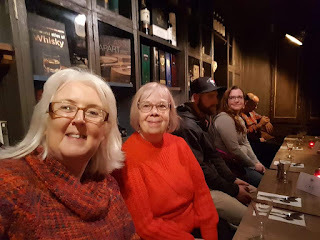 They also told us that if you walk round deck five four times you have walked a kilometre, so I decided I would do that at least once a day as I knew I would have to walk off some of the wonderful food we would be having! I had a lie-in and skipped breakfast as I didn't sleep well due to the motion and engine hum of the ship. Today the major stop was at Ålesund. Marian decided to go on a hike up 400 steps to Mount Aksla which overlooks the city. I went out to explore the city by myself rather than go on the organised tour as the ship was docked right near the centre and it was not a large area to explore. Plus the tours are quite expensive! The city had been almost totally destroyed by a fire in 1904 (the fate of many Norwegian towns/cities due to them being mainly built of wood in the past.) 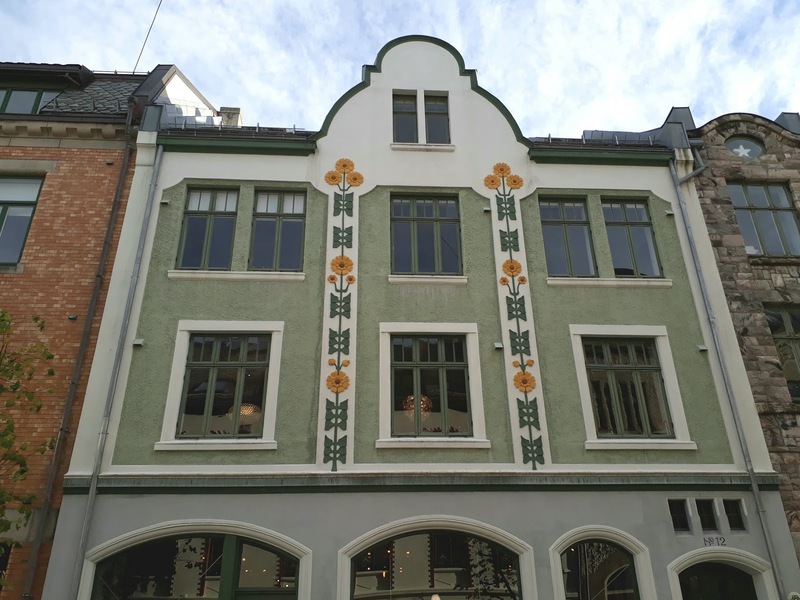 When it was rebuilt much of the architecture was in the Art Nouveau style which is one of the things the city is renowned for nowadays. 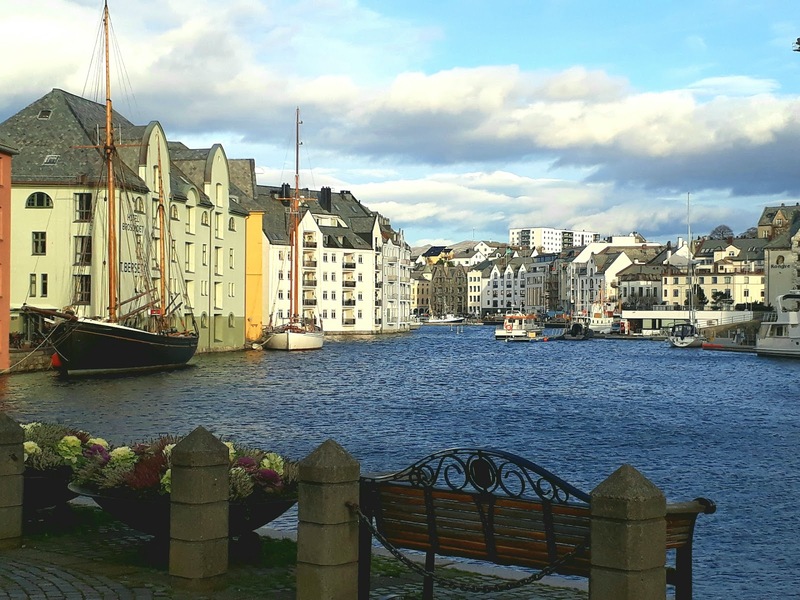 It was a mild and sunny day as I explored the cobbled streets of Ålesund which indeed had some beautiful buildings often painted in bright colours in typical Scandinavian style. 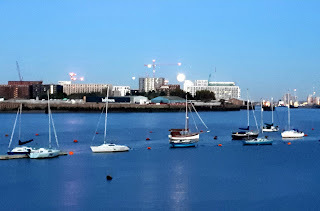 The city is built on islands and there are lots of bridges and waterways, it is very picturesque, laid back and I really liked the place and it would be a place I would love to return to and explore some more one day. I returned to the ship and Marian returned not long afterwards having enjoyed her hike with its amazing views over Ålesund. 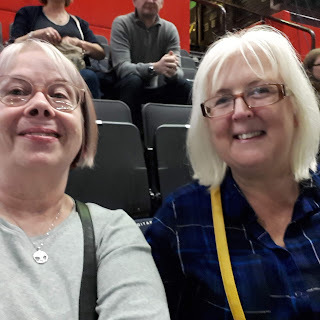 We later went to the Norwegian Way of Life talk by Bjorn and David which was very informative and entertaining covering such subjects as elk, language,music and art of Norway. During dinner it came over the ship's intercom that the northern lights were visible. There was a mass exodus from the restaurant as people headed out to see the. The lights were light green and formed a semi-circle in the sky at the front of the ship. They were gorgeous and magical and it was also surprisingly mild out on deck five. What a brilliant start to the trip! Update, and Seamus's First Birthday!